Takes 60 Minutes , serves 16. Lightly grease two loaf pans. Add a wide strip of parchment into the pan lengthwise, with enough overhang to grip. 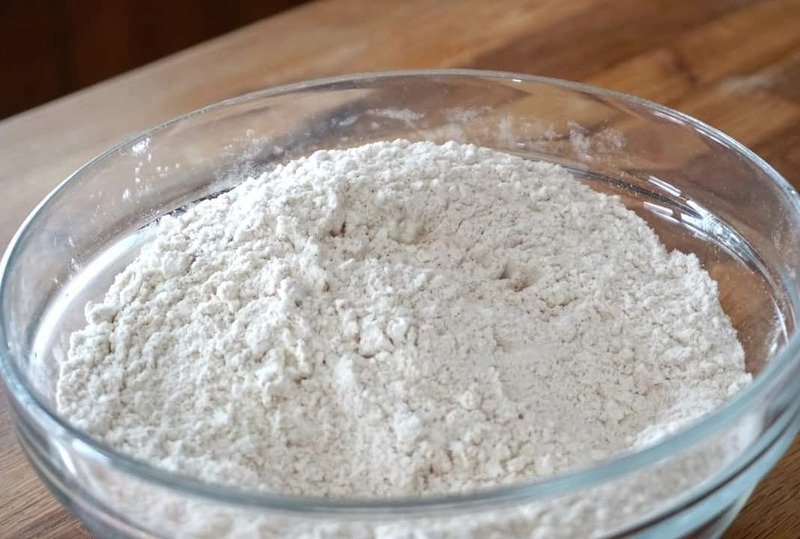 Place all of the dry ingredients into a small bowl and stir until incorporated. Set aside. Beat the eggs in a medium-sized bowl using a hand mixer until light and frothy. Continue to beat while adding the sugars and vegetable oil until incorporated. Stir in the vanilla. 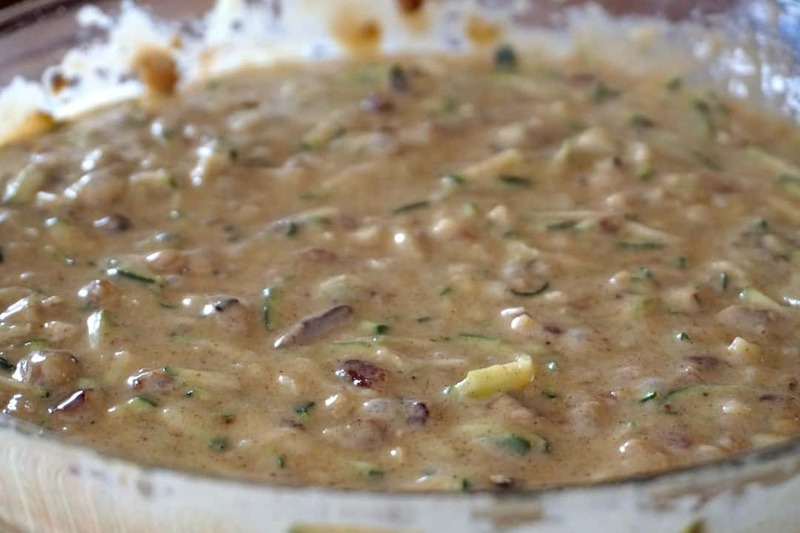 Sprinkle in the dry ingredients, stirring to remove all lumps and form a smooth batter. 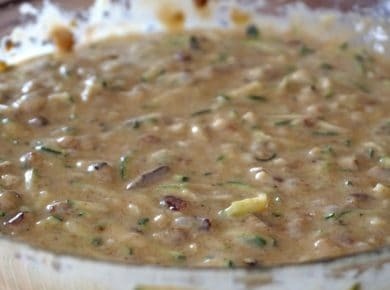 Stir in the zucchini followed by the nuts. 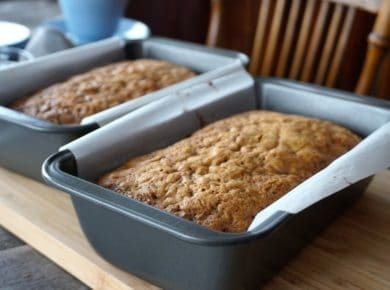 Divide evenly between the two loaf pans, smoothing the top of the batter out evenly. Transfer to the oven and bake for 50 minutes or until a cake tester comes away clean. Cool in pans for 15 minutes before pulling the breads up using the parchment paper. Cool for about 20 minutes before dusting with icing sugar, slicing and serving. 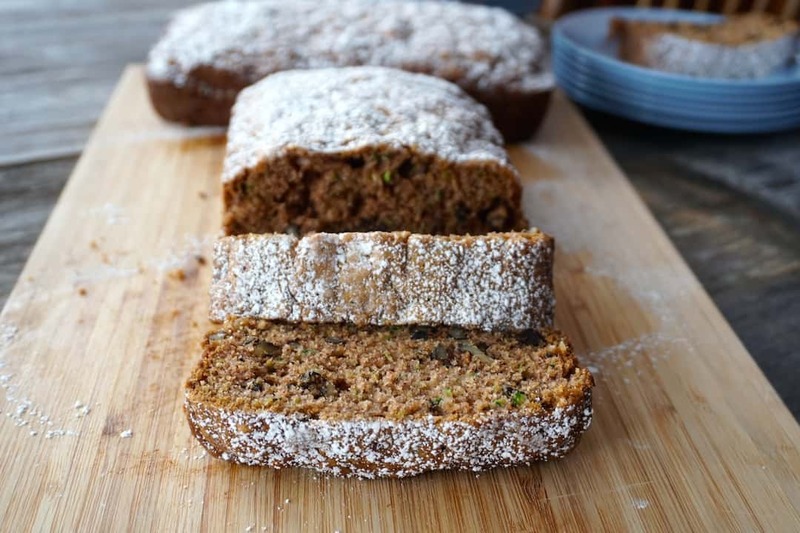 This SPICED ZUCCHINI BREAD is my new favourite baked good. 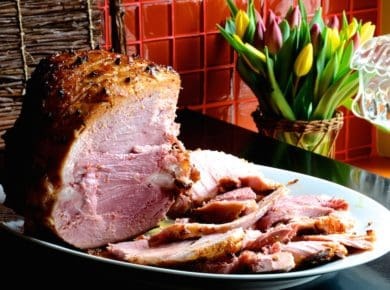 It’s easy to make, really tasty and needs nothing more than a receptive audience – which could just be YOU! I’m going to start by sending some serious love to my beloved business partner, Carol. Not only does she do a great job with the strategy and social media platforms for Weekend at the Cottage, but she also puts up with me! 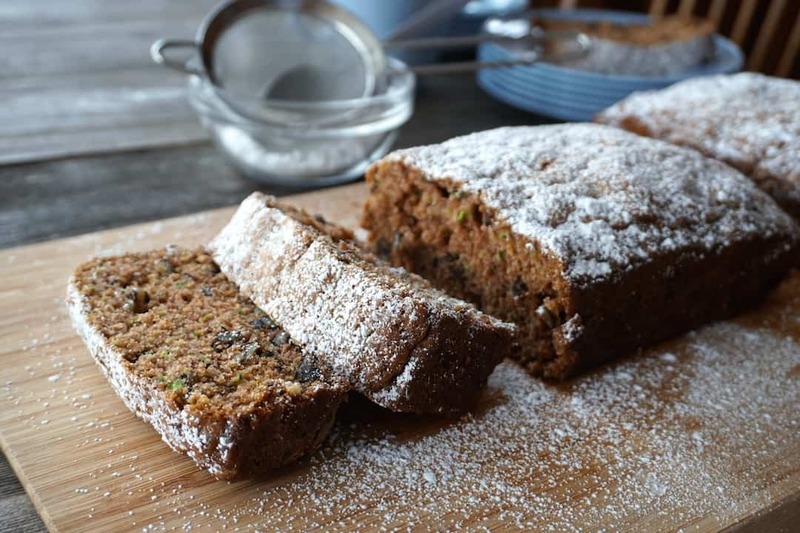 Case in point – I made this awesome SPICED ZUCCHINI BREAD, shot the video and sent photos off to Carol. She called 10 minutes later. Good point, especially since it’s not! 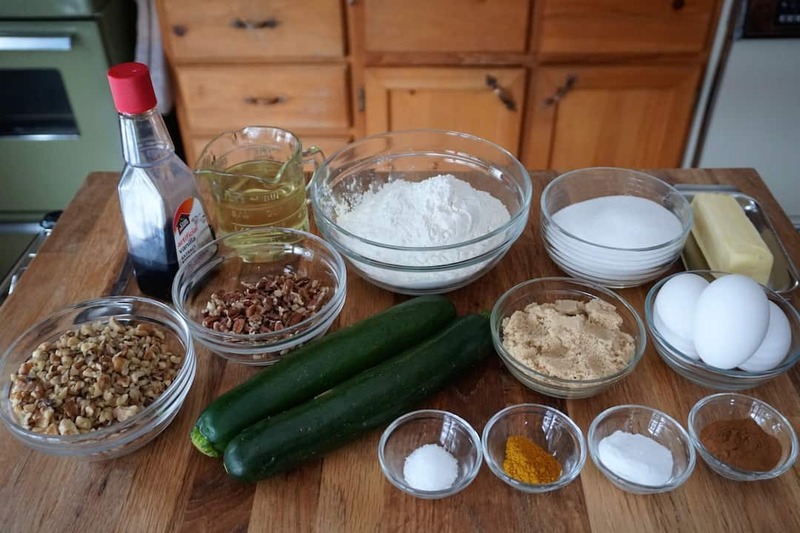 So how about I share this wicked recipe for SPICED ZUCCHINI BREAD? Wait until you try it! Before I launch into all the talking points, a reminder to PIN the recipe to a favourite baking board and BOOKMARK for future reference. 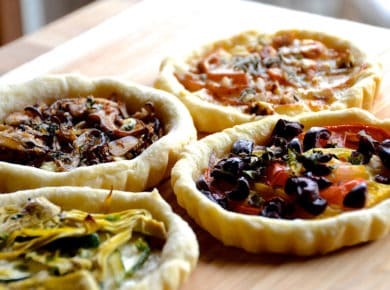 You can also SHARE this recipe on your favourite socials like Facebook, Instagram and Twitter. 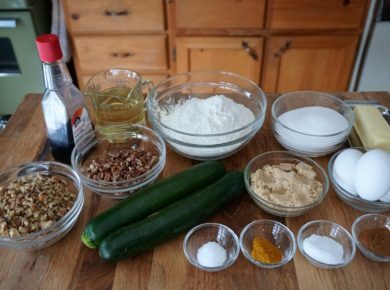 Let’s make SPICED ZUCCHINI BREAD! 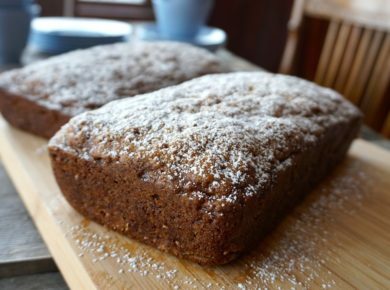 Most zucchini bread recipes call for cinnamon, as did this one. It was only when reaching for it that I saw another option sitting right next to it: curry powder. The addition of this spice sets this recipe apart from others and elevates the flavour to a whole new level. My bread’s journey down this uncharted spice road could have gone awry, but instead, it landed in a much happier place. The curry pairs perfectly with the cinnamon, and having a sweet baked good flavoured with this distinctive spice is surprisingly good. 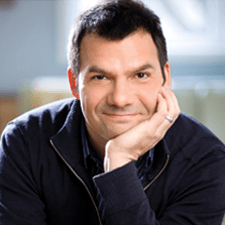 Don’t be frightened – it’s fab! 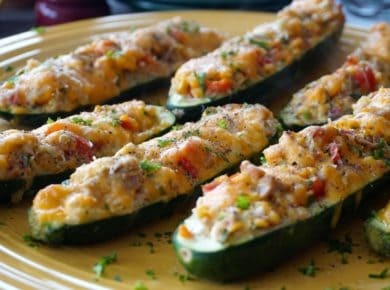 I really like using zucchini in recipes. 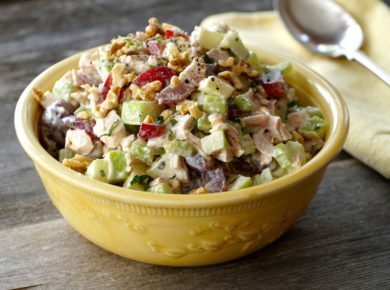 If this one ingredient is what brought you here, we have other ideas too. 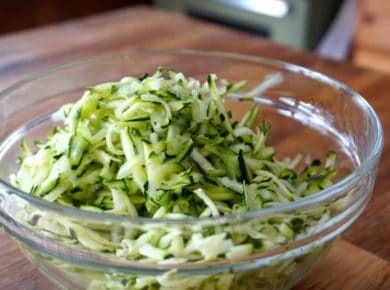 Click HERE to see how we use zucchini to bind our JUICY BURGERS or click HERE for our ZUCCHINI SALAD WITH TRUFFLE OIL. 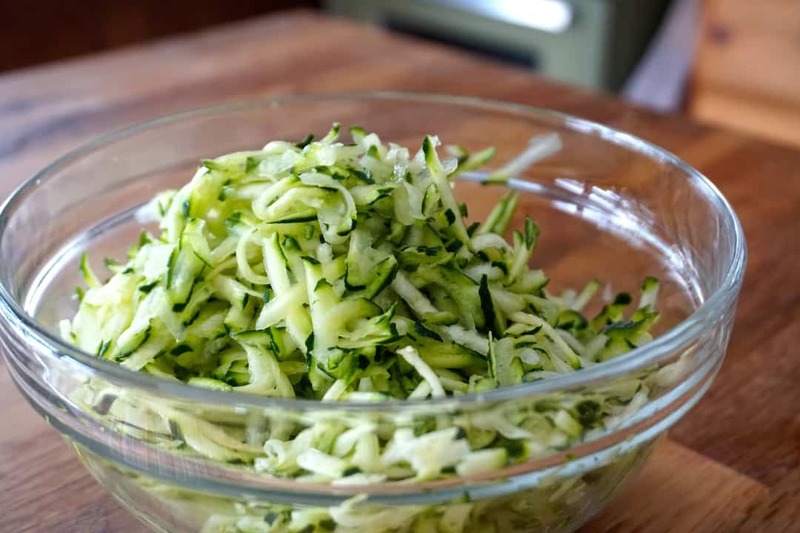 In this recipe, we keep this extra easy – all you need to do is grate two zucchini. For best results, do this step by hand, as working with this vegetable is simple. I’ve listed my favourite box graters in the Amazon links below if you need one. Pulling together the batter for these loaves is also easy. Although I use a hand mixer to beat the eggs, sugar and oil together, you can go old school and do this step by hand. One other thing about the batter is that it holds shape. 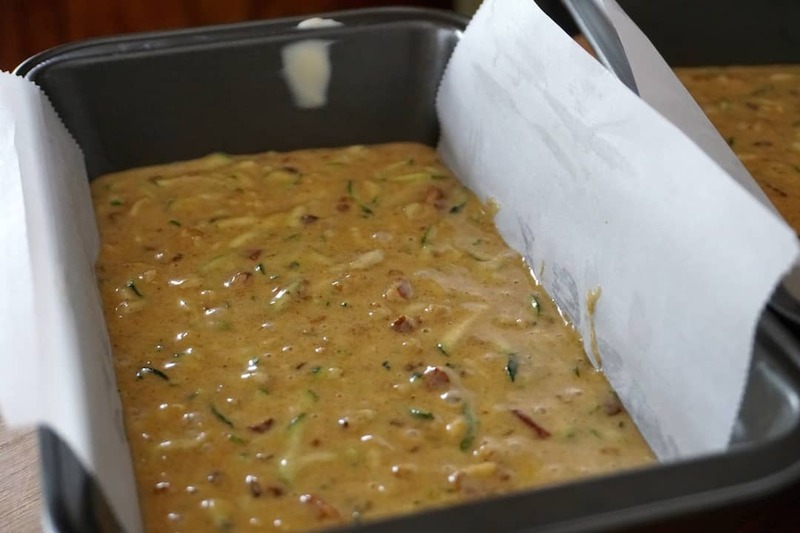 The grated zucchini and nuts stay suspended in the batter, giving a uniform look to the cake when you slice into it. 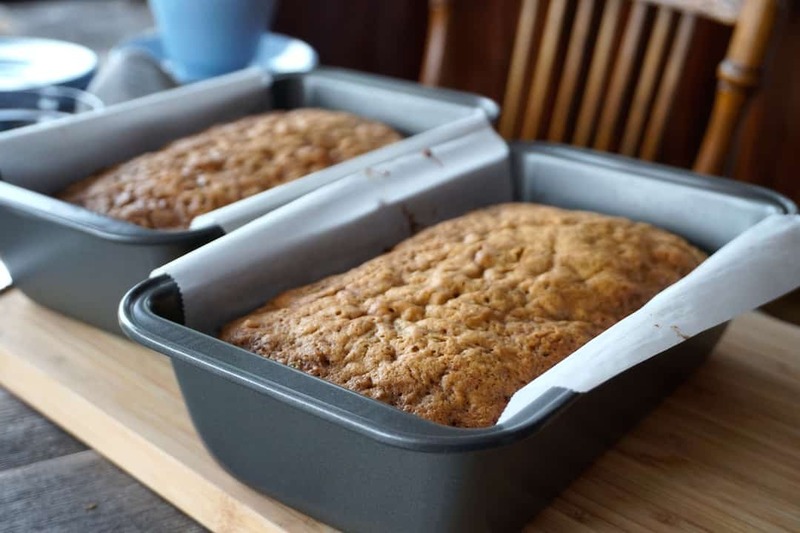 Adding wide strips of parchment paper to your loaf pans makes removing the loaves a cinch. This way of lining pans also works with our MOIST LEMON POUND CAKE and BANANA BREAD recipes. We’re just trying to make your baking life a little easier. Yay! 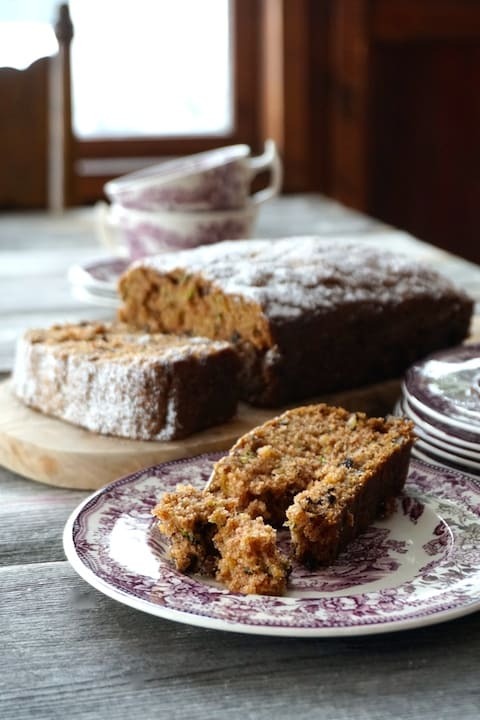 No need to get fancy when you go to serve your SPICED ZUCCHINI BREAD. We suggest you add nothing more than a light dusting of icing sugar. There’s something to be said for keeping the look simple, making your guests even more amazed by the flavours. 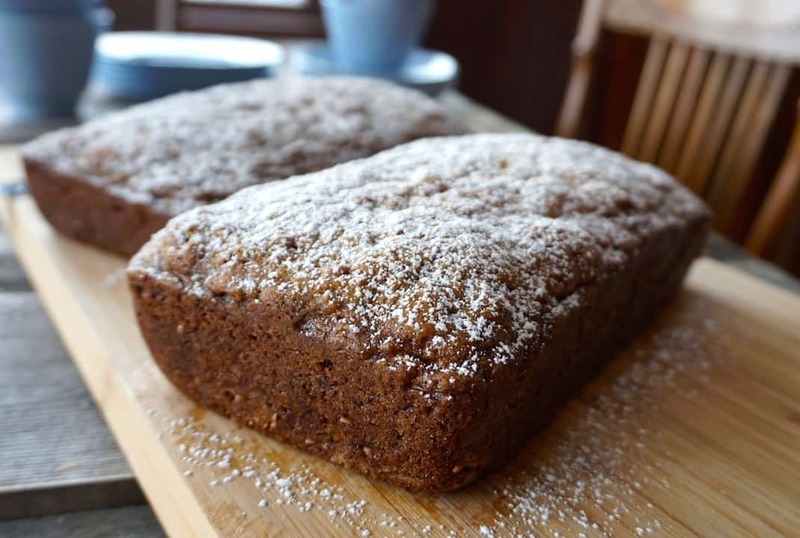 The last awesome thing about this recipe is the yield – two loaves! 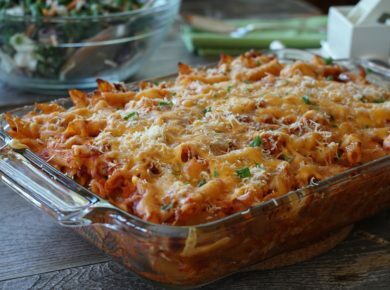 I bet you’ll go through one in no time, especially if you have a hungry family and friends in your midst. I often package up the second loaf and drop it off to friends to enjoy. You can also wrap and freeze it if you’d like to save it for another time. 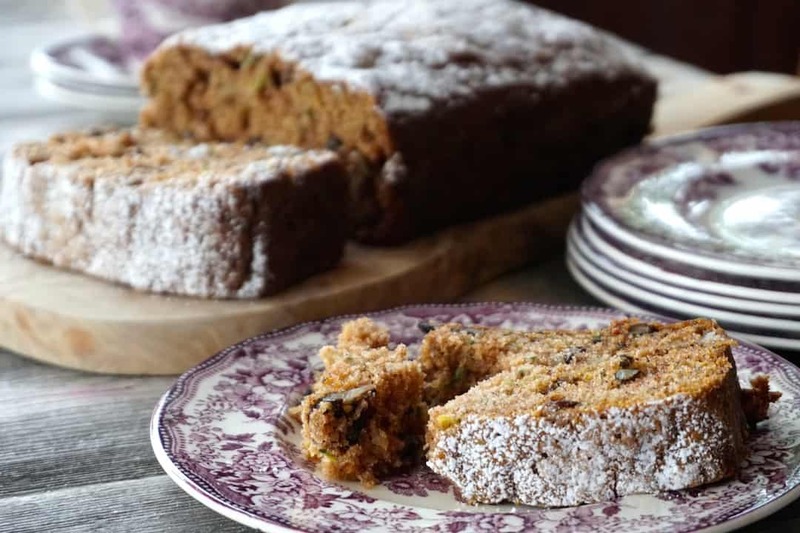 If you’d like to enjoy your SPICED ZUCCHINI BREAD with an equally memorable beverage, try this SPICED CHAI LATTE; it’s such a winning combination. 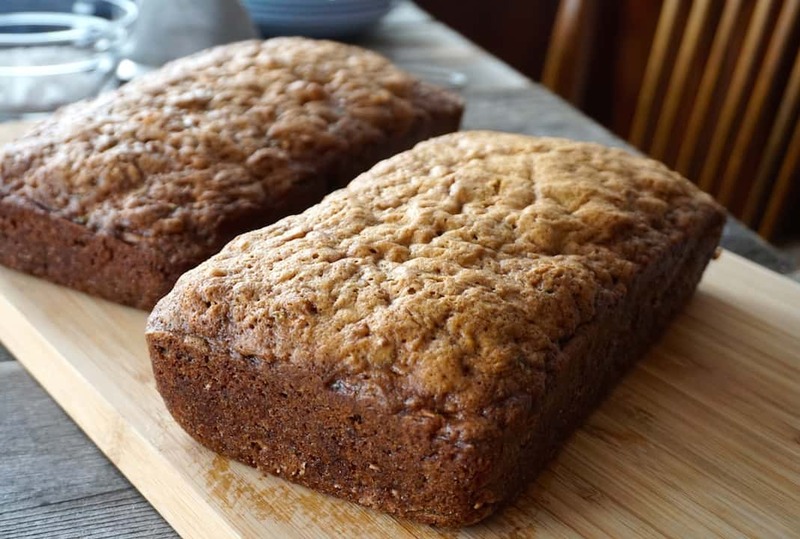 Spice up your next afternoon snack or coffee klatch with this SPICED ZUCCHINI BREAD!